Duck Foot Brewing Company slings pints of gluten-reduced beer at their new San Diego brewery and tasting room. What started as a hobby in Matt DelVecchio’s garage, turned into a passion for creating new craft beers and a dream to one day open a brewery of his own. However, when DelVecchio discovered he had Celiac’s disease and the gluten in the beer was making him ill, the dream was temporarily dashed. While other breweries had attempted gluten-free options, DelVecchio was discouraged by the lack of flavor in those on the market. Determined to find a solution, he added a natural, flavorless gluten-reducing enzyme, that doesn’t affect the overall flavor of the brews. 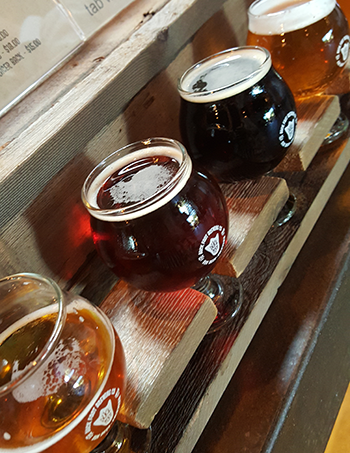 Duck Foot’s lineup of boast-worthy brews include Blonde Ale, Red Ale, IPA, White Double IPA and a Chocolate Hazelnut Porter. Seasonal offerings will include Honey Ale, Coconut Molasses Brown Ale, Ukranian Imperial Stout and Belgian Wit Bier. The tasting room is just as fun and friendly as the name of the brewery, with an industrial design complete with open floor plan, a view of tanks, and fun comic-inspired mural artwork. DelVecchio, an avid snowboarder, says the name of the brewery is inspired by his stance on his board. With both feet pointed slightly out, the board is more maneuverable in either direction when riding freestyle down the mountain. Duck Foot Brewing Company will welcome several different food trucks on the weekends, and guests can also bring in their own food to enjoy with the beer. The brewery also has plans to bottle their craft brews as well as distribute to several different San Diego restaurants that will carry the beers on tap.